A view of the Trans-Canada Highway from the Cadillac's interior. Photo: Posnov/Getty Images. If I had the disposable income to buy a semi-autonomous Cadillac CT6, I’d also be inclined to privately sue, for crimes against scenery, the person or persons who drew the routes for the Trans-Canada Highway. If you’ve driven this humongous country along its main artery, it can be frustrating to be so close and yet so far from the Thousand Islands or from Lake Superior or to get the most distant glimpse of the capital of Quebec to which it connects. But the drive east from Quebec City on the Trans-Canada’s Highway 20 — in a car that effectively drives itself — stymies all attempts to hide natural beauty. Around Kamouraska, rocky hills abound, and the St. Lawrence River begins its transition into an ocean. Forty-five kilometres on, at Rivière-du-Loup, you can book a whale-watching cruise. It is one of the most beautiful transformations of the world outside your windshield — even with projected images on said windshield reminding me of the speed limit and other bits of information usually confined to my dashboard. The event was the Canadian press launch of the Cadillac CT6 with Super Cruise control. A few years short of the completely self-driving cars you keep reading about, Super Cruise is a reminder of just how independent our cars are becoming from human involvement. In short, once you’re on a qualified highway with marked lanes and defined on-ramps and off-ramps, you can activate Super Cruise, and the car turns with the road, maintains whatever speed you set and keeps a reasonable distance from cars ahead. You just sit there, your hands and feet doing nothing until the next lane change (which is still in human hands). And as I discovered, when some idiot cuts you off, it keeps a cooler head than I would (if two hard drives in the trunk can be said to have a head). At one point in the 160-kilometre drive, an 18-wheeler driver obliviously switched lanes in front of me, requiring my car to brake. My reaction would have been to hit the brake hard and lean on the horn. The Super Cruise slowed down so smoothly I could have had a full coffee with no lid and not spilled a drop. “Anything you can do, Super Cruise can do better,” says Cadillac Canada product manager Harry Ng, my passenger for the launch, adopting a proud parent tone (although he tends to refer to Super Cruise as a “spouse” — more on that in a bit). For all this, Super Cruise is a Level 2 semi-autonomous technology, meaning it requires your attention, even if you’re not actually doing anything. It watches your face and alerts you if your attention diverts for more than a few seconds by flashing a green light on the steering wheel. A few seconds more, and the light turns red and the car coasts. Continue to ignore Super Cruise, and you get a voice prompt, after which you are assumed to be incapacitated, the car slows down with hazard lights flashing and then stops. if you remain unresponsive, OnStar, the vehicle safety system, is alerted. This is more of a commitment than I initially signed on for. But now I’m interested in how far I can push the boundaries of this relationship. (And so, for that matter, is Ng.) We talk for a bit, with my head turned, and test the alert levels (without going so far as to have ambulances en route). Pretending to eat, I conclude I could do some pretty good noshing, so long as I don’t spend too much time with my head down, unwrapping a burrito. So, other than giving you less to do behind the wheel, what’s the point of all this? 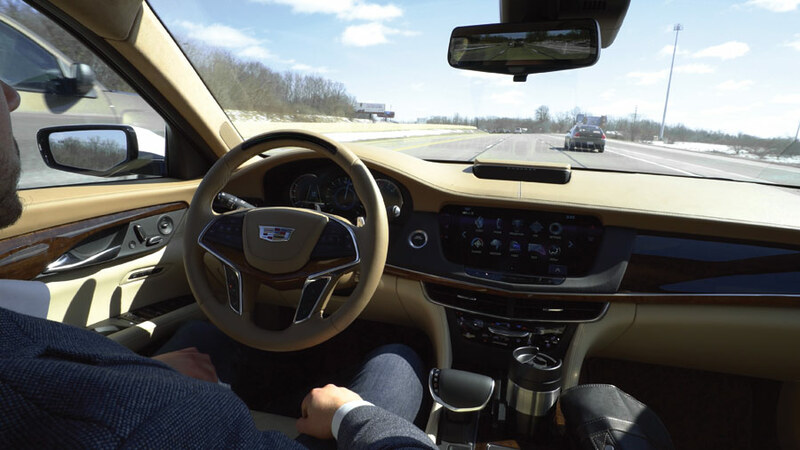 Cadillac has mapped out some 200,000-plus kilometres of North American highway, giving the CT6 Super Cruise four times the GPS accuracy of the standard system you likely have now. It literally knows the road more than two kilometres ahead. And last year, it kicked off the technology with a series of drives from New York to Los Angeles, with journalists taking their hands off the wheel in stretches like Memphis to Dallas and Dallas to Santa Fe. It’s anecdotal, but Ng believes Super Cruise goes a long way toward solving the problem of driver fatigue. “Here’s the thing,” he says. “Have you ever wondered why you’re so tired after a long drive? You’re in the comfort of the driver’s seat. You’re not doing any strenuous physical activities. But you’re tired. “It’s because during the long drive, you have done many, many thousands of what we call dynamic driving tasks. You continue to process the visual information. You check the left and you make the right, you make steering corrections. For now, this human “spouse” still has his place. I was the one who had to get this honking Cadillac through the narrow streets of Old Quebec (backing up and turning in reverse at one point because a delivery truck blocked my way). And if I really wanted to put Super Cruise to the test, it would be through the Blue Ridge Mountains of West Virginia, Virginia and North Carolina, a white-knuckle run where the Interstates (I-79 and I-77) are full of 70 m.p.h. hairpin cliff turns and “runaway truck” ramps. Some day. In the meantime, resisting the urge to grab the wheel at an approaching turn remains a true test of willpower.